A few months ago, I moved SEOno to Cloudflare. The site was getting a ridiculously high number of malicious login attempts, and while none of them got through (thankfully), I looked into it and the volume of them suggested that it was slowing my site down. I moved onto Cloudflare – a fairly quick, painless process – and not only have the login attempts ceased, but the site is tons faster. Job done. At the time, I noticed that HTTPS URLs were working on the site, in addition to HTTP URLs. In other words, https://seono.co.uk/ loaded the homepage, as did http://seono.co.uk/, whereas only the latter had done previously. “Cool,” I thought, thinking nothing of it for ages – I figured that the rel="canonical" tag of the HTTP URLs would take precedence, and at some point I’d sort it out properly. Rather than having the same canonical tag (and therefore one ‘version’ taking precedence over the other), they were each referencing themselves separately. 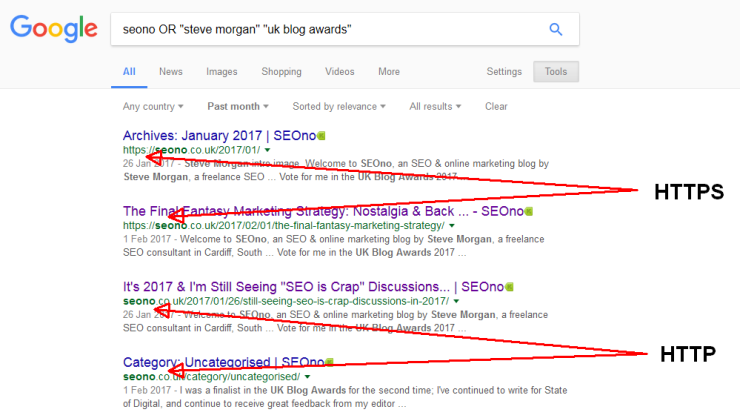 This meant that the introduction of the HTTPS URLs had resulted in a duplicate content issue site-wide, with every page of the blog having two URLs showing the exact same content. Given the fact that Google was indexing some URLs of one type and some of the other (rather than all of one and none of the other), it was looking as though Google was struggling to understand which version to show predominantly. And worst of all? I hadn’t noticed for months, despite picking up on issues like this when I do technical SEO audits for clients. D’oh.